Kuala Lumpur is the perfect stop-over destination. I’d particularly recommend a few days in KL towards the end of your trip, or on your way back home because the opportunities for shopping are plentiful. It’s not the most architecturally beautiful city but it does offer enough for a few days of sightseeing and street food that are particularly easy to access as a stop-over if you’re flying from Europe to Australasia (or vice versa). I was lucky enough to be staying with some expat friends who had loads of great ‘insider’ knowledge about where to go. One place I particularly loved was a homeware shop called Peter Hoe. It’s one of those places you would never know was there unless somebody showed you show to get in because it just looks like a completely unremarkable apartment building on the outside. It’s very near Central Market and Chinatown, opposite the Guan Di Temple and if you love homewares as much as I do it’s not to be missed. I felt quite disappointed I wouldn’t be able to buy anything to bring home as it’s only the start of my year-long trip at the moment. But, if you’re only visiting for a short time, or if you’re on your way home, it’s perfect for gifts and souvenirs. It also has a cafe that does some really yummy light-lunches. The chicken and mango salad, in particular, was delicious and it was a great haven away from the heat and bustle of Chinatown. Start with a walk around the surrounding streets for some knock-off designer goods, and then finish in Peter Hoe for a well-deserved ice tea. Another one of my trip highlights was our walk around KL’s Little India. I used to live in Bangalore, so it felt really nostalgic to walk through this area. It was really authentically Indian and the food available was brilliant. We visited a little curry house called Sri Pandi and I had a great time sampling all the different Indian dishes available on their very popular buffet. 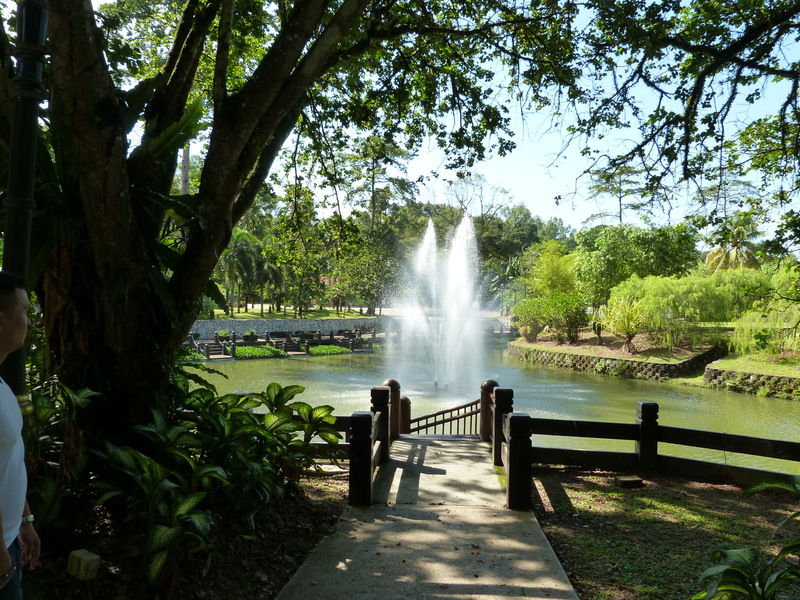 On Monday morning I joined my host on her weekly expat wives walking group, which took us through Perdana Botanical Gardens. The park was lovely but I wouldn’t recommend going there too late in the day because we all finished the walk completely drenched with sweat, even though we set off relatively early in the morning. We finished the walk round the gardens at the Hornbill Restaurant & Cafe, which is actually inside the walk-in aviary of the adjacent bird park. The fresh juices were delicious – a cold watermelon juice after a walk through humid KL was very welcome – and we were even able to get a sight of the Cafe’s mascot, the Hornbill, from the balcony. Batu caves are a bit outside the city centre but are well worth a visit. You can quite easily get an Uber there to avoid being ripped off on taxi fare and it’s only about a 20-minute journey. The steps up to the caves are teeming with monkeys, they can be quite naughty if you have food so make sure you don’t carry any with you and you should be fine. People who go up wielding bunches of bananas are just asking to get scratched or bitten in my opinion. For now, it’s time to pack up my bags and head off to my next destination: Auckland, New Zealand. Here, I’m going to be staying with some more friends for a week before starting my month long tour around NZ. I can’t wait!